What is another word for frustration? 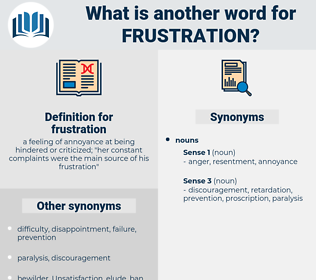 a feeling of annoyance at being hindered or criticized; " her constant complaints were the main source of his frustration"
unease, powerlessness, disagreement, aggravation, unrest, deception, uneasiness. disappointment, disillusionment, exasperation, disillusion, discouragement, displeasure, indignation, disaffection, dismay, resentment, annoyance, unhappiness, despair, despondency, desperation, irritation, helplessness, bitterness, disapproval, setback, hopelessness, outrage, anxiety, depression, distress, regret, failure, feeling. assistance, cooperation, boost, pleasure, facilitation, encouragement, boon, aid, promotion, help, triumph, support, blessing, advance, happiness, success. content, gratification, fulfillment, bliss, delight, satisfaction, felicity, contentedness, joy, gladness, contentment. The pang of pity he felt changed to frustration when he recognized the root of the problem: Why can't he understand that this is exactly what he should be doing, designing new computers, and let me run the company? But the Connecticut authorities were not forgetful of Laud's purpose in 1638 to appoint a bishop over New England, and its frustration by the political unrest at home. 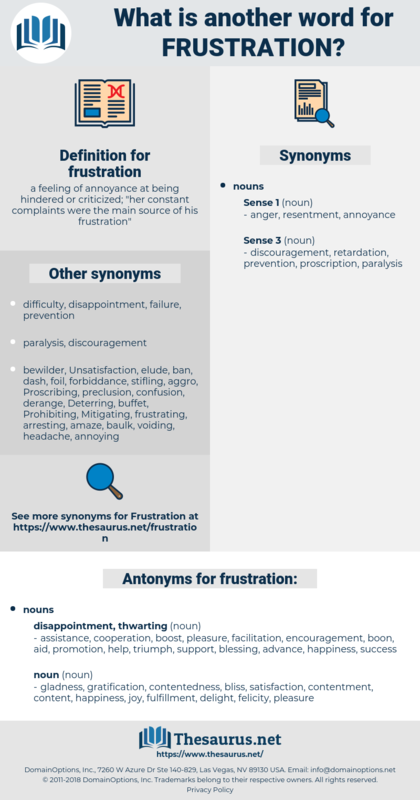 annoyance, vexation, disappointment, letdown, chafe.